Our Business partners HP have, and continue to, invest in accessible technology as part of their mission to create an inclusive environment focused on connecting people to the technology they use. Their wide range product portfolios are designed to remove barriers between users and their print technology. In addition to these features, HP is reinventing voice command and screen-reader support with the HP Accessibility Assistant A true advanced offering for improved access and use, the kit includes a prop handle for reaching assistance, plus braille labels and an accessible keyboard for visual assistance. 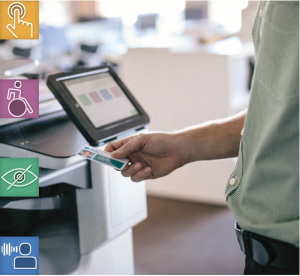 Most impressively, session-based voice command can also be activated with a single touch increasing employee productivity with a device that lets users effortlessly communicate with a range of HP single and multifunction printers and scanners. For example, to copy using the devices the user simply activates the voice control with one press of the button and states the number of copies required ’10 Copies’. The result is innovative approaches that make it easier to use Vision’s award winning solutions and systems to accommodate a wide range of unique user needs while also addressing a variety of accessibility guidelines and regulations. Teamed with our Print Management software solutions, Vision’s Managed Print Solutions continue to offer world leading technology to improve productivity whilst empowering a diverse workforce.